One of the units in my Allied North African forces will be the LRDG. I am not 100% on which Commonwealth country this unit will represent, still doing the historical research. 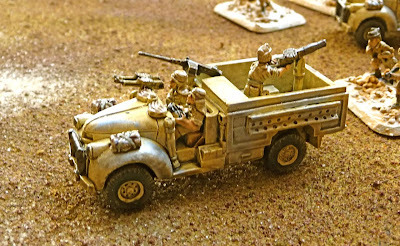 Interesting enough an Indian Army Long Range Squadron was seconded to the LRDG, maybe they will enter the scenario as some Punjabi's. This little group will be on night reconnaissance in my planned scenario in the Tunisian hills, when they happen upon on some well entrenched elements of the 15.Panzer Division. These are all Battlefront figures, the infantry are actually the SAS pack, but I can't tell the difference! 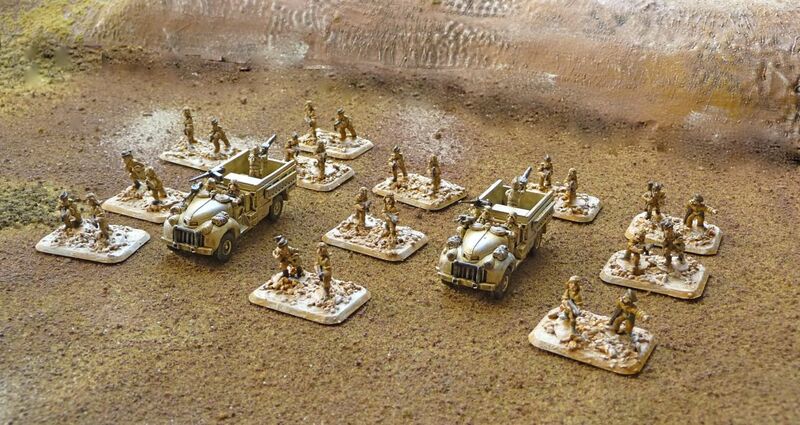 They were the first WWII unit I painted, and essentially they were painted by hand, I am not sure of the uniform colour I used, and then AP was applied by brush. I was relatively happy how they came out and I could see that the AP method was going to work on these 15mm figures. I am planning to change the base colour but more on that later. I could not resist the 30 cwt Chevrolets so I bought a couple of them to go with the men. These are also from Battlefront and were relatively easy to assemble and had lots of guns. 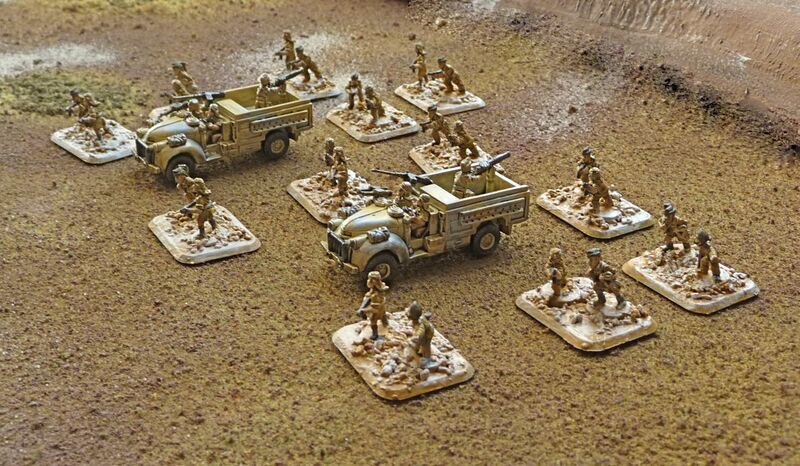 The basic colour was Vallejo Dark Sand and this was applied using an airbrush. The camouflage is GW Space Wolves Grey and all though it looks a little dull in the photo, it looks quite nice in reality. This was also applied with an airbrush. I have been really thinning the AP darktone, I find it works better, thinned it does not even shine as there has been no matt applied here. The men's uniforms are Vallejo Iraqi Sand. The gun to the right is a Lewis LMG gun and on the left is a Browning Mk II MMG. There is also another LMG mounted on the dash. I suppose we will see what all this means when we play our game. I have placed the driver on the left, I have seen photos with both left hand and right hand drive configurations. Nicely done, John! I quite like the use of the Space Wolf gray on the Chevy's.